The Lomography La Sardina Deluxe Kit features the El Capitan, Fischers Fritze, Sea Pride, and Marathon La Sardina cameras along with a Fritz the Blitz flash with filters and a special open-spine book. 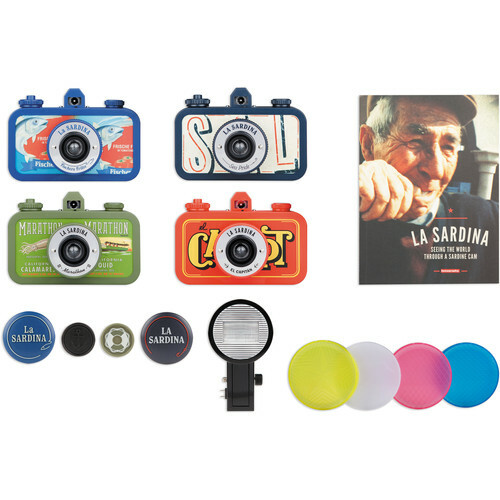 The La Sardina is a 35mm film toy camera specifically designed to bring more fun and chance to your shooting routine. These compact, sardine can-shaped cameras feature a built-in 22mm wide angle lens with a fixed f/8 aperture and two step focusing system. Two shutter speed settings are available, 1/100th second or bulb, and unlimited multiple and long exposures are possible. A micro flash contact is also incorporated into the cameras, allowing the use of the included Fritz the Blitz flash to provide additional light for your exposures. The shutter release is able to accept threaded cable releases and a 1/4" socket is available for tripod usage. Each body has a unique design and features a built-in inverse Galilean viewfinder to suit the wide-angle perspective of the lens. A film cartridge window allows you to see the type of film you are using and an auto film counter with auto film stopping helps to keep consistent spacing in between frames. Lomography's La Sardina line of cameras are 35mm film cameras featuring a sardine-can shaped body, 22mm wide-angle plastic lens, built-in optical viewfinder, and multiple and long-exposure capabilities. This wide-angle plastic 22mm lens has an angle of view of 89°, giving a broad perspective and great depth of field. A fixed f/8 aperture is suitable for most shooting applications and two-stage focusing gives you the option to focus between 2-3.3' / 0.6-1m and from 3.3' / 1m to infinity. The plastic construction gives images a soft, dreamy quality that truly defines the "toy camera look." Two exposures settings are available: N (1/100th sec.) or B (bulb) for controlling exposure lengths to suit different lighting situations. Additionally, an MX mode is available, which allows you to record unlimited multiple exposures on the same frame. The bulb setting allows you to record long exposures, which is further benefited by the inclusion of a 1/4" tripod socket and a cable release socket to help prevent camera shake. A dedicated micro contact is available in order to use the included Fritz the Blitz flash for more creative exposure possibilities or for simply adding additional light to the scene. This external flash attaches to the side of the camera and features three distance settings (5.25', 4', and 2') for greater exposure control when shooting. Additionally, four colored filters (blue, yellow, white, and red) are also included to creatively modify the color of the flash output. Shutter Speed N: 1/100 sec. Box Dimensions (LxWxH) 16.0 x 9.3 x 3.4"